KATHMANDU, June 29: Stocks maintained positive bias for most of the Thursday’s session. However, the initial upward movement subdued in the final hours as the stock market capped another sluggish session with a flat finish. 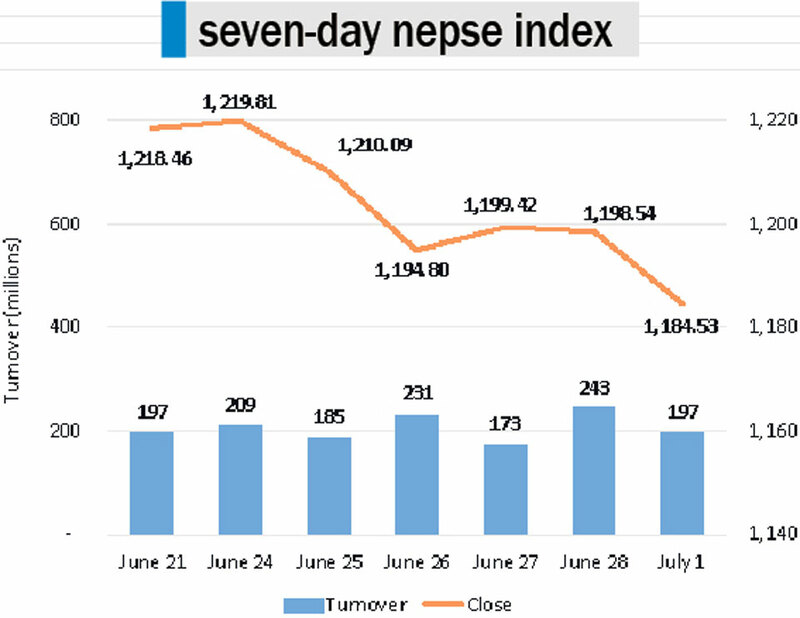 By the close, the Nepal Stock Exchange (Nepse) index stood at 1,198.54 points, posting a marginal decline of 0.88 points. Muted by lack of any major news, market has failed to entice investors. As a result, daily turnover remained comparatively modest in the country’s only bourse despite increasing to Rs 243 million compared to the previous day’s Rs 173 million. Major sub-indices reflected the broader market and posted marginal movements to either side of the spectrum. Weakness was visible among Manufacturing and Processing stocks as its Sub-index lost 0.71 percent. The sub-indices of Hotels and Other sectors also trimmed fell by 0.4 percent each. On the other hand, Finance Sub-index advanced the most and was up 0.55 percent at the close. The sub-indices of Hydropower and Banking also ended the day in green. Soaltee Hotel Ltd’s stocks were most actively traded in the exchange on Thursday. Over Rs 23 million worth of its shares changed hands on the day. Next on the list was Mega Bank Ltd recording a turnover of Rs 14 million. Other active stocks for the day include Nepal Telecom Ltd, National Life Insurance Company Ltd and Nabil Bank Ltd Promoter Share. Naya Nepal Laghubitta Bittiya Sanstha Ltd was the biggest gainer of day as it share price continued to retrace from Rs 1,857 recording a surge of over 6.03 percent. Next on the list was ICFC Finance Ltd which saw its share price rise by more than 5 percent. Ngadi Group Power Ltd, Central Finance Company Ltd and Nabil Equity Fund were among other top gaining securities. Conversely, Reliance Finance Ltd led the list of losing stocks with a drop of 4 percent. Mirmire Microfinance Development Bank Ltd also shed almost 4 percent. National Microfinance Bittiya Sanstha Ltd, Kalika Microcredit Development Bank Ltd and NMB Microfinance Bittiya Sanstha Ltd followed suit, posting a loss of about 3 percent each. In the corporate news, National Life Insurance Ltd is closing its books on July 6 for 60 percent rights issue. After the issue, the insurer’s paid-up capital will reach Rs 2.64 billion. Furthermore, Central Finance Ltd’s proposal to distribute 8.5 percent bonus shares has been approved by Nepal Rastra Bank (NRB). ARKS technical analysis model indicates indecision in the market with the formation of a tiny bearish candlestick on Thursday. After reaching the intra-day high of 1,203.96 points, the index pulled back around the unchanged line of 1,200 points. Index failing to close above this level indicates absence of significant impetus to propel the index upward. Meanwhile, Relative Strength Index (RSI) and Moving Average Convergence Divergence (MACD) suggest that the market is yet to recover from its prolonged bearish setting.